The Toyota Tacoma is one of the most popular trucks on the market. It’s a big vehicle though, so we can forgive you for trying to get an extra few horsepower out of the engine. Regardless of your reason for getting an aftermarket exhaust system, this list of the best exhaust systems for the Toyota Tacoma will help you pick the right look and sound of exhaust to match your desires. MagnaFlow have been in the exhaust game for over 30 years, forming out of the still successful Car Sound Exhaust company. MagnaFlow offer a range of exhaust products for trucks, muscle cars, and performance exotics. Their philosophy focused not only on power, but sound and quality as well. Magnaflow operate a large R&D center just north of San Diego, which keeps them at the forefront of automotive technology. All components are expertly designed, flow bench tested and proven on a dynamometer. To back it all up they’re ISO-9001 certified and provide lifetime warranties on all their products. 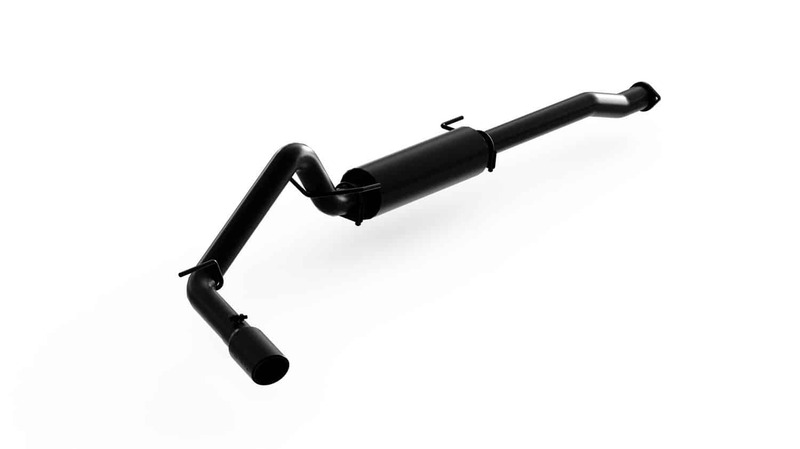 The MagnaFlow 19291 is their interpretation of the performance exhaust for a Toyota Tacoma. It’s a single output exhaust and exits behind the rear axle. The tip is large and round, with the same polished stainless steel appearance of the rest of the exhaust. Composed entirely out of 409 stainless steel, all bending of the 3” tube is done with the help of a mandrel. 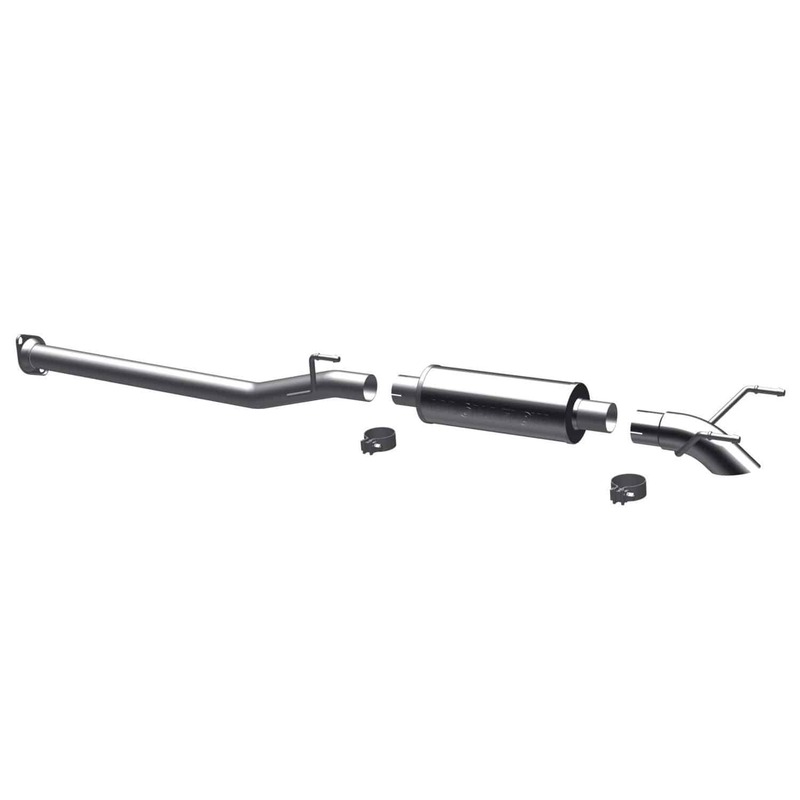 The straight-through flow muffler is sure to up the power and torque of your truck, while providing the best in and out of car sound. Receiving the top ranking from customers, it’s also the most expensive product on our list, by over $100. If quality and performance are what you want though, it may be worth paying the price. Installation is quick, customers are full of praise for its quality, and they’re loving the sound. 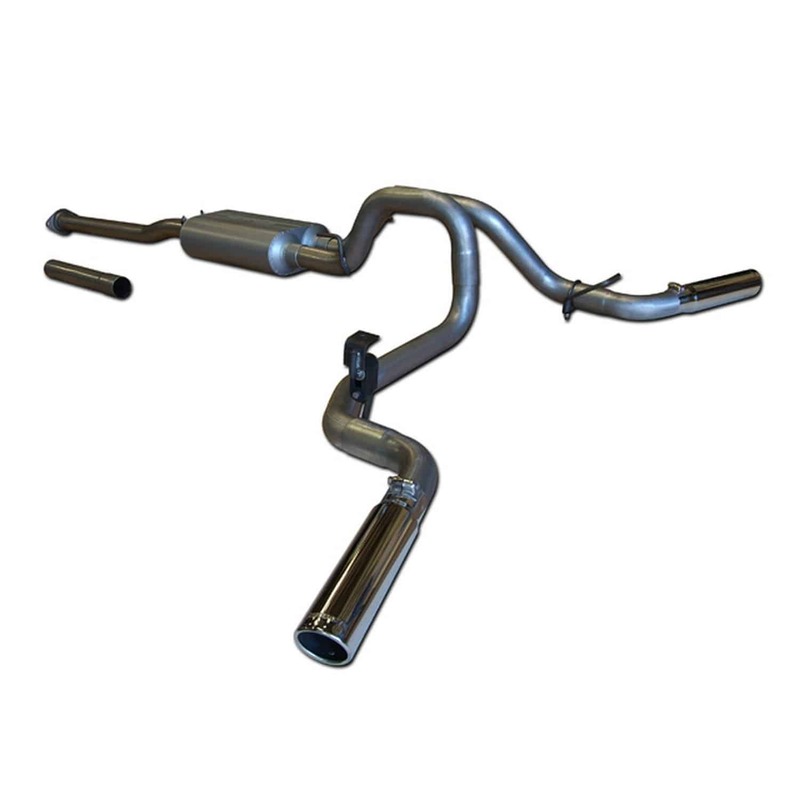 Full marks all around, and our nomination for the best exhaust system for the Toyota Tacoma. If you’re not paying too much attention, you may mistake the MBRP S5326AL for the MagnaFlow we just said was the best. But on closer inspection there are a number of reasons we don’t put it top of our list. The lower rating does also mean a lower price though, so be sure to balance those out when you make your decision. While having the same general form, MBRP make use of several pieces of tubing, instead of the one-piece design MagnaFlow incorporated. Along with that is the change to MBRP’s own muffler design. The tailpipe is a large, 4” diameter polished stainless steel module that has the MBRP logo emblazoned on its side. MBRP have been in the business for over 20 years, starting a business around snowmobiles they’ve developed into the company they are today covering the racing, off-road and performance on road sector. They strive for excellence in their products, working hard with customers and distributors to build a strong brand name. The MBRP S5326AL then doesn’t disappoint, with positive customer reviews. The biggest compliment going to the sound performance that has a solid throaty noise. If buying this kit for a crew cab short bed or access cab, keep a saw handy, as one of the pipes needs to be shortened to get it to fit. On top of that, the product is not fully stainless steel, with several components made from aluminized steel. Shouldn’t be a problem for most, but if you regularly drive on roads that they salt in the winter, rust will set in a bit quicker than a full stainless steel alternative. We always like it when a manufacturer releases performance products for their own vehicles, and thanks to the Toyota Racing Division, this is true for your Tacoma as well. 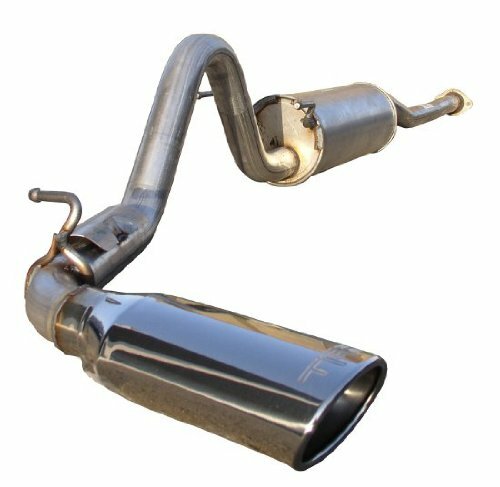 We know many people appreciate fitting genuine parts to their car, and that’s what TRD have provided in the form of their cat-back exhaust. Once again, we have an almost identical design, with muffler going to a behind the axle, enlarged tip. Starting at the back you’ve got a polished stainless steel tip that has the TRD logo etched into it. This product is specifically for short bed variants of the Tacoma, and they don’t seem to have a full bed option at this time. The system allows a less restricted airflow, improving power by 5 to 8hp at the wheel. If you’re looking for a deep, throaty tone for your Tacoma, along with some extra power, all while maintaining your 100% Toyota truck, the TRD offering is definitely for you. It is one of the more expensive options, but that is to be expected with an original manufacturer part. Customers mostly love the product, saying that it gives a great sound and noticeable power gain, with just one reviewer complaining that it is too loud. TRD put a lot of effort into their products, all engineered with the same approach that they apply to their racing offerings. Flowmaster’s product is one of the few exhaust systems that chooses to split the output, resulting in a twin exhaust from the muffler, sending one pipe to each side of your vehicle. Still bending over your rear axle, exhaust tips protrude behind the rear wheel mud flaps. The tips in question have a diameter of 3” and are made of polished stainless steel. The rest of the system is based around 16 gauge, 2.5” diameter aluminized steel tubing. A full stainless steel model is also available, but will set you back an extra $100. The exhaust falls into Flowmaster’s American Thunder range of mufflers, with a moderate to aggressive sound provided. Even with the extra exhaust pipe, they’ve made sure to include the necessary hangers to make installation easy. Flowmaster have a strong racing pedigree and are founded on the principles of sound engineering. Their mission is to provide the best exhausts products to the market, putting a lot of effort into research and development of new products and technologies. The Flowmaster 1732 falls mid-range as far as price is concerned, but it does give you the desirable dual output. The product has sold relatively well with no negative reviews. Although a slight drone is noted at highway speeds, it is not annoying, and is more than made up for the rest of the time. Installation is straightforward, although several customers recommend welding the exhaust in place once fitted. Back to the one-legged variants, DynoMax offer the 39447 as a full stainless steel exhaust system at an amazing price. The cheapest exhaust system to choose from, the 2.5” tubes are all mandrel bent and welded together, although it does come in three parts. The muffler is one of DynoMax’s UltraFlo units which come with a limited lifetime warranty. They have an unrestricted, straight-through design, that reduces back pressure and provides a unique sound while their patented Continuous Roving Fiberglass technology reduces drone. DynoMax are so confident in their products that they offer a 90-day sound guarantee, allowing you to return the product if you’re not satisfied with the way it sounds for a full refund. As expected, the products get dynamometer tested to ensure a premium performance from the system. The system finishes with a large 4” diameter, single walled tip that is made from polished stainless steel. The low price DynoMax put on the 39447 ensured that it has sold well, with mostly positive reviews from customers. The sound is good, as is the performance, and the price even more so. Some customers felt the noise was a little more aggressive than expected. Another MagnaFlow product, the 17115 is a considerably cheaper alternative to the 19291. The major difference here is that the 17115 does not send the tailpipe out the side, but instead dumps it underneath the car. Simplifying the design, but removing any visual aspect associated with the product. Otherwise it matches the 19291’s stainless steel construction with 2.5” diameter tubes all mandrel bent. The muffler has a straight through design with perforated core, along with the shorter piping results in a much more aggressive sound. Designed as part of the off-road pro series, it’s goal is maximum performance and minimal weight. Designed to MagnaFlow’s high quality standards, it might not be our choice for your daily driver, but would be a lot of fun for the off-road enthusiast. From customer reports, it works better for short bed vehicles, although can be made to fit on a long bed. Beyond that, as loud as the product is expected to be, some people who bought it didn’t realize just how loud it was. This alone seemed to get it a few negative reviews. MBRP round off the main products in the review, with the black and beautiful S5338BLK. A full stainless steel model, it’s mandrel bent from a larger set of 3” tubing, culminating in a typical 4” single side, black tip. Part of MBRP’s black series, the performance exhaust is designed to maximize flow and minimize temperatures, helping your Tacoma perform better. Built to industry standards, all their products get trialed on the dynamometer before being released to customers. With a history that started with snowmobiles, MBRP have always had a penchant for off-road vehicles, taking extra pride in their top of the range products. If you’re looking for both an aggressive look and sound, the MBRP S5338BLK fits that bill. This product is fairly new on the market, owing to it being designed for 2016 and later models of the Tacoma. Customer feedback is neither here nor there. It fits a long bed model, but can be cut to fit those with a short bed. Even still one buyer had trouble fitting it themselves. A bit loud for some, there’s no drone at high speed, and otherwise sounds good. 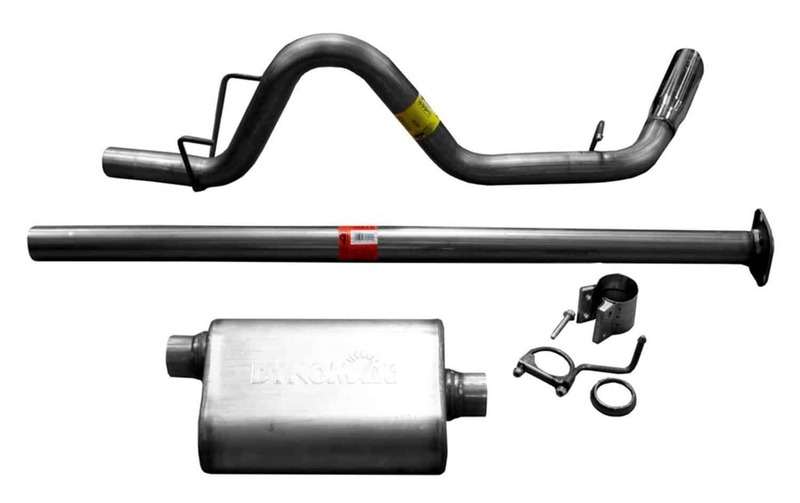 A single side offering from Flowmaster, but a lot more expensive thanks to its full stainless steel muffler and tubing. The 16-gauge tubing comes fully welded and assembled, ready to attach to your pickup. The sound provided is described as moderate, falling in as part of their dBX performance range. Improved power and torque are ensured thanks to the Laminar Flow technology the system integrates. Finished off with an attractive polished stainless steel exhaust tip, the Flowmaster logo is just noticeable, etched on the edge. Flowmaster have a good reputation, and their dBX range is one of the best. For that you have to pay though. If you thought the Flowmaster was expensive, aFe know how to take it up a notch. High price is at least here linked to high quality, and aFe have put a lot in to ensure their 49-46022-B model puts out. A custom muffler formed from stainless steel, you can expect a deep tone from their Mach Force-XP range product. Also provided are an increase in horsepower and torque. In the looks department aFe have opted for an overly large black tip with aFe Power logo emblazoned on the side. Although Gibson’s history has them starting off trying to give a motorhome a boost, their 30 years of experience has done them well, resulting in a company putting out quality products for trucks, off-road vehicles and a range of other performance vehicles. The fairly expensive Gibson 618814 is a 3-piece kit of 2.5” diameter stainless steel tubes, carefully bent with mandrels and welded at other points. Their own muffler is provided, with a baffled and chambered design, it doesn’t have any packing which results in minimal drone and an aggressive sound. The product is rounded off with a 4” polished stainless steel tip with their own rolled slash-cut design. Backed by a lifetime warranty, it offers power gains in the 5-7 hp range. The first-generation Tacoma with its 4.0l V6 engine was produced for over ten years, resulting in the massive selection of aftermarket products available to you. Decisions are harder than ever so we hope the information we’ve compiled here today will help you make your own choice as to what you consider to be the best exhaust system for the Toyota Tacoma.